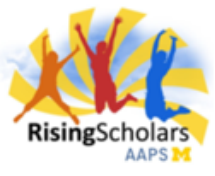 The Rising Scholars program is a leadership program within Ann Arbor Public Schools designed to create access and opportunity for underrepresented yet high achieving students in an effort to decrease the documented achievement gap in AAPS and prepare them for postsecondary path of their choosing. During their time in the program, students will participate in a Summer Learning Academy (SLA), identify personal and academic goals and participate in leadership, college preparation and career readiness opportunities. Increase enrollment and completion in rigorous courses including AC and AP courses. The Summer Learning Academy (SLA) is an 5-day leadership academy where invited incoming Rising Scholars begin their transition from middle school to high school. Students preview high school content, learn soft skills for high school success, and begin to build relationships with their cohort members. - Under served does NOT mean low income. While some of our families may be considered low income, it is not a requirement or a criteria used for student selection for the program. Visit our eligibility page to review the program requirements. Under represented or under served refers to students who have a demonstrated skill set but have traditionally not had an academic program to meet that skill set. For example, African American males are under served in our AC/AP courses. The Rising Scholars program helps student gain access to those courses and equally as important, be successful in those classes. - This program is only for a certain demographic. The profile of a Rising Scholar is varied and wide. Our students represent multiple countries, languages, ethnicities and socio-economic backgrounds. - Does this program cost money? There is zero cost to participate in the Rising Scholars program. - Will my student miss opportunities by being in this program? On the contrary, our Rising Scholars have access to increased opportunities for learning and resource identification through our many community and educational partnerships.